Enjoy Freeport’s most beloved activity of bonefishing with a team of captains that are as passionate and as experienced as they come. With Captain Phil & Mel’s Bonefishing charters in Freeport, you will head to the shallow flats off the west coast of Grand Bahama Island to take part in the unforgettable activity of bonefishing in the Bahamas! There is no place on Planet Earth that takes its bonefishing as seriously as we do here in the Bahamas. We have the world’s best conditions and destinations for bonefishing, that is without a doubt. 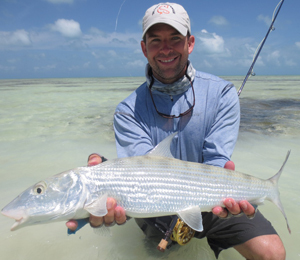 While bonefishing is often a seasonal things in other tropical destinations, here in Freeport the bonefish are biting throughout the year. So whether you are visiting Freeport in summer, winter, fall or spring, there is always a bonefishing charter waiting for you to enjoy! What makes Bahamas bonefishing so exciting is the style of fishing. Bonefishing is unlike any other type of fishing, since these silver-colored shiny fish are not the easiest catch! But many an angler will argue that they are the most exciting catch! You will be fishing out in the shallow water flats, either from our small skiff or you can even get in the water and fish from there (make sure to pack some wading boots or ask your captain if you can rent some). Captain Phil and Captain Mel are some of Freeport’s most renowned bonefishing experts. They will share with you all their tricks and secrets, so even if you are an experienced angler, you will most likely learn a new thing or two from these captains. We also welcome guests who are completely new to the world of bonefishing. We will have you pulling in that bonefish catch in no time! I have been to the Bahamas many times, but Captain Phil's Bonefishing in Freeport is one of my favorite trips! It includes everything that everyone should do here. As a Bahamas veteran, I can say only the best about this experience!